Molecular mixologists usually use laboratory equipment and techniques to create interesting cocktails with new textures, flavors and presentations. But there is one category of cocktails that usually does not require any special equipment or ingredients: “Cocktail Gels”. These are just sophisticated Jell-O shots that, to revamp the reputation of those Dixie cup shots that knocked you out during college, are often called cocktail gels, edible cocktails, gelée cocktails, gelatin cocktails or solid cocktails. Whatever you call them, if you make them right, your friends and customers will be delighted. Unlike the traditional college jelly shots, which are usually made with fruit flavored gelatin and intensely spiked with vodka, the gelatin cocktails of molecular mixologists are made with perfectly crafted cocktails, unflavored gelatin and impressive garnishes and presentation. 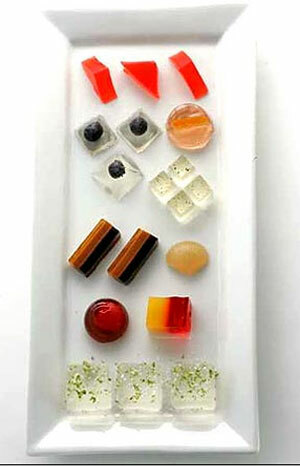 Bar Nineteen 12 in Beverly Hills serves a flight of five jelly shots, molecular mixologist Eben Freeman makes a Cuba Libre gelatin square and at Craft restaurant in Los Angeles, pastry chef Catherine Schimenti serves jelly cubes of Prosecco, simple syrup and vanilla bean seeds. Some time ago I came across the beautiful work of Michelle Palm who runs the website Jelly Shot Test Kitchen. 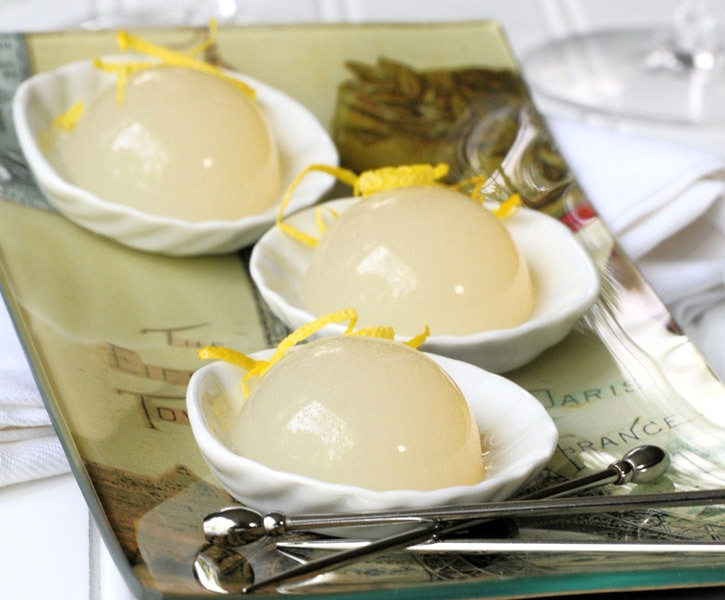 Michelle, a hedge fund consultant in Edina Minnesota, got hooked with the art of jellifying classic cocktails when she first made piña colada jelly shots to bring to a friend’s barbecue and had a huge success. Since then, Michelle has become the queen of jelly shots and has mastered the technique so well, that she has published a book and has even been asked by Dolce & Gabbana to create a jelly shot for their luxury magazine Swide.com. Michelle’s cocktail gels recipe book, Jelly Shot Test Kitchen, was released in May 2011. The book includes 60+ jelly shot reinterpretations of your favorite classic cocktails in gelatin, as well as several Jelly Shot "mocktails", tons of photos and step-by-step instructions. Several presentation techniques are covered throughout the book including layering, embedded shapes, angled layers, gradient layer, bubbles, checkerboard, skewering, garnishing and embedded fruit. (you can buy Jelly Shot Test Kitchen from Amazon). When making your own cocktail gels, it requires a little of trial and error to get the proportions right. You want them firm enough so they can be grabbed with the hands but soft enough so the cocktail gel melts in the mouth and does not feel too rubbery. Strong cocktails such as martinis should be diluted with simple syrup, water or higher ratio of mixers to reduce the alcohol content and allow the gelatin to set (gelatin needs enough water content to be able to set). Other cocktail ingredients like citrus juice, bitters and strong flavor spirits may also need to be adjusted. Michelle has already taken the time to adjust over 60 classic cocktail recipes to obtain the perfect cocktail gel so if you don’t want to waste your time, get her book! Michelle shared with MolecularRecipes.com a few of her wonderful tips for making cocktail gels and some recipes to get you started. Thank you Michelle! Jelly Shot Test Kitchen recipes are based on Knox powdered gelatin. A rule of thumb is to use one envelope of Knox gelatin powder for every cup of liquid. You should use a little extra gelatin if you are planning to use molds or skewers. Always dissolve the gelatin by heating water or mixers but never heat the alcoholic beverage to prevent the alcohol from evaporating. If you want to use gelatin sheets or agar agar, Jelly Shot Test Kitchen came up with a handy conversion rule. Jelly Shot Test Kitchen tested Dr. Oetkers Gold extra 3" x 5" sheets but if you are using a different brand, they’ve found that you generally need a little bit more sheet gelatin than indicated on the package to arrive at a just-firm-enough jelly shot. Instructions: Prepare the sheet gelatin by soaking for a few minutes in cold water, squeeze out excess water, and add to the recipe before heating. 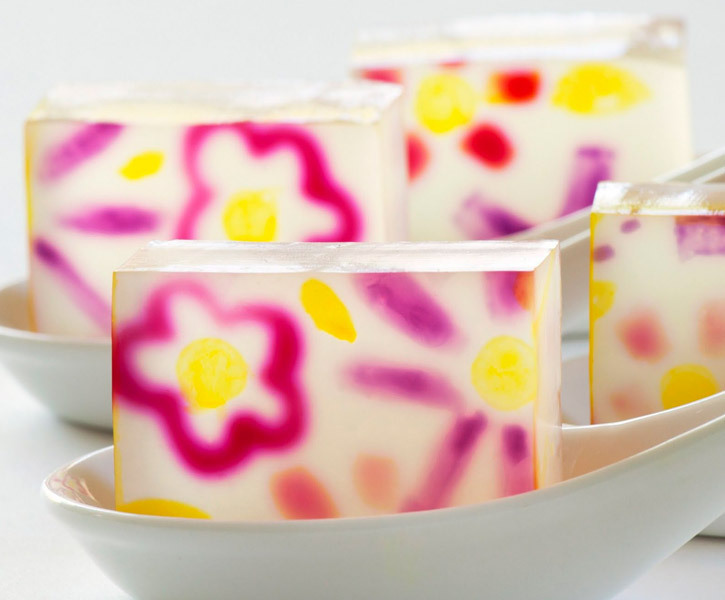 If you need a vegetarian alternative, you can use Agar Agar instead of gelatin (buy Agar Agar). One small benefit of Agar Agar is that it does not melt at room temperature but you usually want your cocktail gels to be cold when they are consumed so this is not a big plus. A problem of Agar Agar is that it is not clear when it gels so for some preparations using clear liquids, the presentation may not be as good as it would be when done with gelatin. Instructions: First, make sure all your ingredients are at room temperature. Add 1/2 of your mixer liquids (i.e. anything non-alcoholic, such as juice, soda, water, etc.) to a small saucepan. Sprinkle with agar agar. Allow to soak for five minutes. Bring mixture just to a boil. Reduce to low heat, and simmer for 1 to 4 minutes. (When you can see that the agar agar is fully dissolved, it’s done.) Remove from heat. Working quickly, add the remaining amounts of your mixers to the agar agar mixture and stir well. Next, stir in the liquor(s). Pour mixture into desired pan, and place in refrigerator to set. If you are using a flexible silicon mold to set your agar agar based jelly shots, make sure it is extra squeaky clean. Apparently, agar agar doesn't react well to grease or oil. Cold soluble gelatin is very convenient for molecular mixology as it does not require to be heated to be dissolved (buy Cold Soluble Gelatin). If you use the cold soluble gelatin we sell in our store, you need about 4 g of gelatin to jellify 300 g of liquid. Instructions: it is recommended that you first mix the cold soluble gelatin with caster sugar or any other powdered ingredient and then add the liquid while stirring. You can also blend the gelatin directly in the liquid without mixing it with caster sugar first but you have to incorporate it gradually while mixing to avoid creation of lumps. Most cocktail recipes require the addition of sugar or syrup so just use caster sugar instead and mix it with the cold soluble gelatin powder first. Presentation is key to ensure a great molecular mixology experience! Follow these tips from Michelle and you’ll be able to obtain her beautiful results! Prepare the molds with a light application of cooking spray. Then wipe the mold cavities out with a clean paper towel. This method will leave just the slightest residue, which will help unmold the gelatin without affecting the taste or appearance. Place each mold on a cookie sheet or cooling rack to provide a stable surface for handling. To unmold, loosen the edges by pulling away from the side of the mold, and just pop each jelly shot out. Inexpensive silicon ice cube trays are great for making cocktail gels. Jello Molds, Bundt pans, plastic candy molds, etc. Prepare the molds with a light application of cooking spray. Then wipe the mold cavities out with a clean paper towel. This method will leave just the slightest residue, which will help unmold the gelatin without affecting the taste or appearance. To unmold, fill a large container or sink with warm water (not too hot!). With clean fingers, loosen the gelatin around the edges of the pan/mold. Next, dip the mold almost to the edge into the warm water for just a few seconds (10 seconds is usually a good start for larger molds, and 5 for individual). Dry the bottom of the mold with a towel and check the edges to ensure they have loosened up. (If not, repeat the dip for just a few seconds.) Place your serving plate on top of the mold and invert. - Try using a paper guide for your knife. Cut out strips of graph paper or lined notebook paper, then place (don’t press) on top of the set gelatin mixture, and run your knife along the edge of the paper strip. - Another easy method is to make a series of cuts, dividing the set gelatin first into two parts, then dividing each part again in two, working from vertical to horizontal cuts until the shots are the desired size. - Michelle’s favorite knife for cutting jelly shots is a boning knife - medium length blade with a thin profile. - You can make cocktail gels the night before serving but don’t cut them or unmold them until about an hour before serving. - If catering large parties, serve cocktail gels in very small batches, ice cold from the fridge as a 'passed' item, rather than setting a tray out next to the cheese plate. - If your jelly shots are going to be sitting out for longer than 20 to 30 minutes, will be served on skewers or will be set in a mold, add an extra ½ to full envelope of gelatin (25% to 50% more gelatin) to the recipe for more staying power. - Chill your serving platters and/or place the platter on a bed of ice so the cocktail gels last longer. - Want a more dramatic effect? Place the serving platter over a recipient filled with ‘smoking’ dry ice, on a glass box filled with ice and lighted from inside (Bar Nineteen 12 in Beverly Hills) or make your gin and tonic cocktail gels glow with UV light. Michelle shared with us the recipes of some of her delicious and beautiful cocktail shots: The Bramble, Elderflower Mojito Jelly Shot (created for Dolce & Gabbana) and French 75. 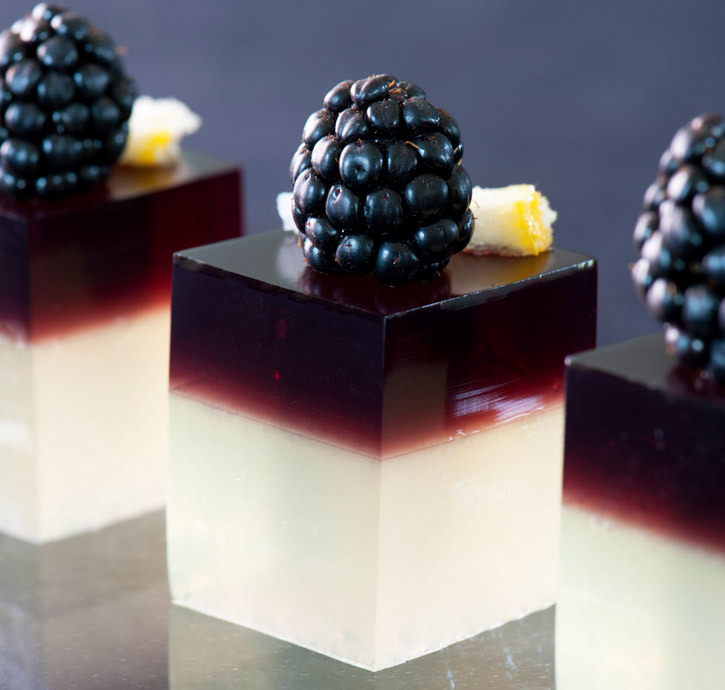 To learn more about making jelly shots and get more cocktail gels recipes, you can purchase the Jelly Shot Test Kitchen book or go to the Jelly Shot Test Kitchen website.